GARDENA, Calif. – September 27, 2017 – Carroll Shelby’s Store and the Carroll Shelby Foundation will lead a charge against breast cancer in October through an awareness campaign and partnership with two highly respected groups that target the terrible disease. During October 2017, a $5 donation will be split between the National Breast Cancer Foundation and Young Survival Coalition for every limited-edition campaign t-shirt, hat or water bottle bought from Carroll Shelby’s Store. National Breast Cancer Foundation, Inc., was founded in 1991 by breast cancer survivor Janelle Hail. After her treatment, Hail committed to educating women worldwide about breast cancer and the importance of early detection. Today, NBCF provides resources including free mammograms, inspiration and support to those affected by this deadly disease. Young Survival Coalition is dedicated to the critical issues unique to young women who are diagnosed with breast cancer. YSC offers resources, connections and outreach so women feel supported, empowered and hopeful. 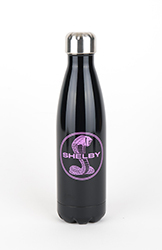 For every exclusive Shelby breast cancer awareness product purchased during October, Carroll Shelby's Store will donate $5, which will be split between the two groups. This year, the campaign includes both men's and women's t-shirts, three different hats and a steel walled water bottle. The items are only available through www.shelbystore.com or inside Carroll Shelby’s Store at Shelby American in Las Vegas. In addition, the Carroll Shelby Foundation will mount an awareness initiative during Breast Cancer Awareness Month. The charity will promote YSC and National Breast Cancer Foundation through digital programs and social media, as well as encourage direct donations to the charities. To learn more about this great promotion available exclusively through Carroll Shelby’s Store, please visit www.shelbystore.com. Automotive manufacturer and entrepreneur Carroll Shelby is one of the most famous and successful high performance visionaries in the world. He was also a pioneer for modern automotive licensing programs; beginning in the 1960s, he began licensing his name and designs for various products. He founded Carroll Shelby Licensing Inc., which is the exclusive holder of trademarks and vehicle design rights for some of the most famous muscle cars and high-performance vehicles. CSL also holds trademark rights for Shelby-branded apparel, accessories and collectibles. Owned and operated by CSL, Carroll Shelby’s Store has both locations and an online store. For more information, visit www.shelbystore.com. For more information about the company or licensing opportunities, call (310) 914-1843, fax (310) 538-8189, write Carroll Shelby Licensing, Inc., 19021 S Figueroa St., Gardena, CA 90248, or visit shelby.com. About the Young Survival Coalition. Young Survival Coalition (YSC) is the premier organization dedicated to the critical issues unique to young women who are diagnosed with breast cancer. YSC offers resources, connections and outreach so women feel supported, empowered and hopeful. YSC was founded in 1998 by three young women who were under the age of 35 when diagnosed. They were discouraged by the lack of resources available and the under- representation of young women in breast cancer research. Today, YSC is the go-to organization for young women facing a breast cancer diagnosis. For more information, please visit https://www.youngsurvival.org.